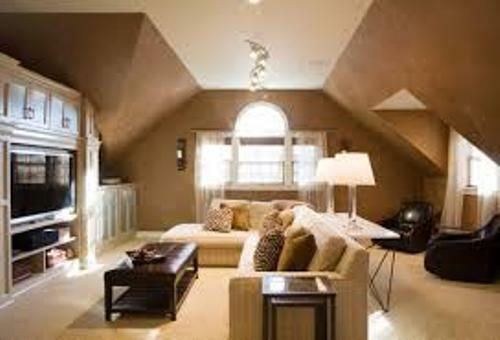 If you are confused to design and decorate the attic bedroom, you have to read the tips on how to arrange a bedroom with slanted walls. The slanted wall can be seen in most attic bedroom. If you made the wrong move, the bedroom looks uncomfortable. The kids will never want to sleep there. Check the post below for the detail ideas about the design and decor in slanted walled bedroom. The bedroom with slanted is very skinny and low. You need to banish the slanted wall by giving a new hint of color on the wall and ceiling. The perfect color to choose in the attic bedroom is the bright and muted ones. Avoid the dark colors. If you want to use dark hues, you need to apply them as the accent. The wall and ceiling can be painted in white, gray, soft gray, baby blue, pink, tan, brown, cream, taupe or copper color. The dimension in the room should be considered too when you decide to arrange the furniture in the slanted wall bedroom. If you have a very small bedroom, you do not need to use many pieces of furniture. You can set a small bed, dresser, chair and side table. The home owners who have big room can divide it in several spaces. You can have a sitting area and a bedroom. You can use a non permanent screen partition to divide the rooms. The ceiling in the attic bedroom is very unique. What makes the bedroom different is because of the slated wall around the low ceiling. To avoid the distraction, you can give the ceiling line a great style. You can have the slanted wall and ceiling painted in the similar color. Or you can use it as the focal point. Apply the colorful and fine wallpaper there. The low lighting is very important to install in the bedroom. 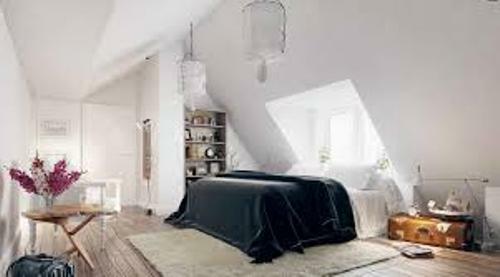 Most attic bedrooms do not receive enough lighting. You can use wall lighting for additional illumination. Painting the wall in dark colors should be avoided for it can create depressing mood. You can also add some table lamps on the nightstand. If you want to get more sunlight during the day, you can install skylight on the ceiling. The room will be bright. Do you want to give opinion about ideas on how to arrange a bedroom with slanted walls?